Throughout 2015, the EARTH University community has come together in many different ways to celebrate our 25th Anniversary. I am reminded now, more than ever, that this institution is made possible only with the energy, passion and commitment of those who share our mission – people like fourth-year student Kevaughn Bonner, who dreams of creating a more self-sufficient Jamaica, and graduates Karen Albuja and Pablo Baumgratz, who you will read about in this edition of EARTH Connections. In May, EARTH’s global impact was celebrated at a London event that included a discussion panel moderated by former CNN journalist Glenda Umana. Accompanying me on the panel were EARTH graduates Sharon Againe (’09, Uganda) via Skype and Gustavo Manrique (’96, Ecuador), Moses Osirus of RUFORUM, Iman Nuwayhid from the American University of Beirut and Ann Cotton, founder and president of Camfed. To make a great evening even more special, we also had a surprise visit from long term supporter Franklin Chang Diaz, who shared his own thoughts on the importance of EARTH during the panel. will welcome our board members and benefactors to campus in recognition of their contributions to the success of EARTH’s first 25 years. The visit will culminate in a concert given by the Costa Rican National Symphony in San José, where EARTH University’s founders will be recognized for their pioneering vision and transformative impact on the University and our students. Join us this year and see for yourself the difference that an EARTH education can make in the world. Student Kevaughn Bonner (’15, Jamaica) is from the rural community of Ritches in Clarendon Parrish. His father is a farmer and his mother is a teacher. Kevaughn grew up with a passion for agriculture and was an active member of the Jamaica 4-H Club, competing in several different categories. This African proverb perfectly illustrates the entrepreneurial philosophy of EARTH graduates Karen Albuja (’09, Ecuador) and Pablo Baumgratz (’09, Argentina), founding partners of La Abundancia, a cooperative of small producers located in the Misiones province of Argentina. In addition to their roles as organic and biodynamic farmers, Karen is the acting treasurer of the cooperative and Pablo works for the Ministry of Agriculture of Argentina. With a total of 12 members, the group produces and processes a wide variety of goods, including medicinal plants and extracts, herbal teas, jams, natural lotions, citrus fruit juice, dairy products made from water buffalo milk and more. 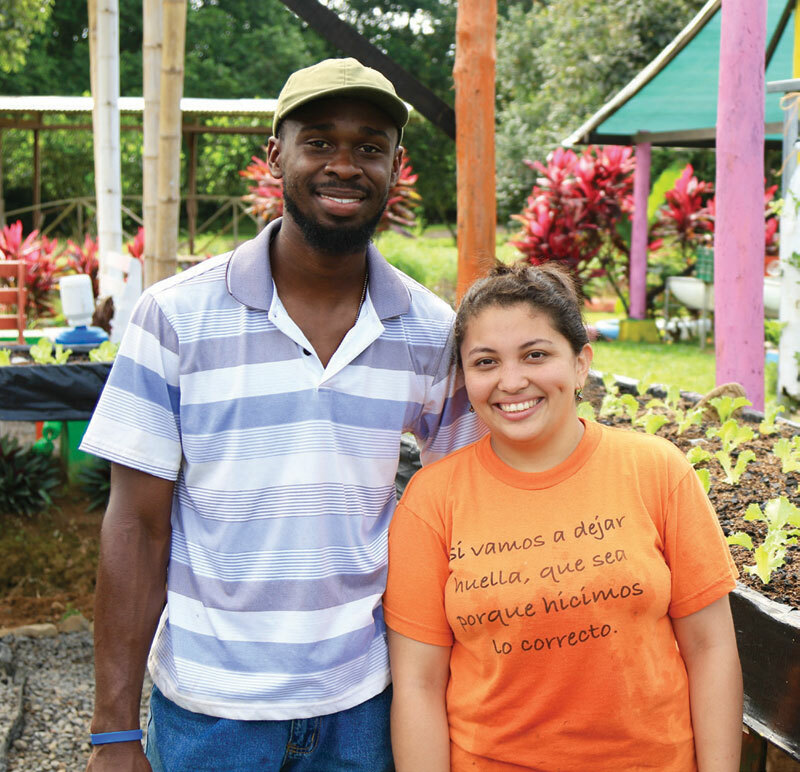 “At EARTH we learned so much from the entrepreneurial project experience and classes like Food Processing and Post-Harvest. For us it was very important to understand this concept of “added value” and realize that you aren’t limited to just selling fresh produce: you can process it and package it attractively and earn much more,” Karen explains. Recently, La Abundancia received a grant from the United Nations Development Programme to produce their own line of mate: a tea made of dried yerba mate leaves that is an important part of daily life for many Argentines. Soon, they will begin selling their certified organic and biodynamic tea under the brand, Arapeguá. “We want La Abundancia to be a cooperative model that can be replicated across Argentina. This cooperative business model can be adapted to any region and any crop. We want to see more groups like ours so that we can feed our country with healthy, sustainable and local food and give people the opportunity to become business owners,” Karen concludes. Barbara’s relationship with EARTH began the year before, when Claudio mentioned that a visitor at his high school gave a fascinating presentation about an agricultural university in Costa Rica that had everything he wanted to study. He was a strong student, but his family’s financial situation made higher education seem like an impossible dream. As a professor of Cultural Anthropology, since the 1970s Barbara has worked closely with the indigenous population in Otavalo, Ecuador to which Claudio and his family belonged, and was keenly familiar with the myriad of challenges they face. After learning more about the University, she urged him to apply. He was admitted– with a partial scholarship from EARTH and additional sponsorship from Barbara – and spent the next four years earning his degree in Agricultural Sciences, returning home after graduating in December 2008. Since then, Barbara and the Butler Foundation – a charitable organization founded in 1987 by her parents, Thomas and Clara Butler – have sponsored the education of four Ecuadorian students at EARTH with the hopes of “creating synergy among the ideas that graduates bring back with them and multiplying opportunities” in communities that lack access to new technology and trained professionals to grow the economy. “It will take some time, but I think every drop of EARTH knowledge that falls into the pool will have an effect,” Barbara contemplates. In 2015, EARTH University welcomes five permanent professors to our international faculty: Entrepreneurial Projects professors Elmer Cantarero (Honduras); Udi Mandel Butler, Ph.D. (England/Brazil) professor of Communications; Gopu Reveendran Nair, Ph.D. (India) professor of Agricultural Technology; Alex Gilman, Ph.D. (England) professor of Applied Ecology; and Jeremy Lackman, Ph.D. (USA) professor of Health and Physical Education.